Shallots are available year-round at grocery stores, but I make the most of them in fall and winter, when the oven is often on and I can roast some along with whatever is baking for dinner. It’s good to keep some on hand because roasted shallots are sweet, mellow and uncommonly good. They are a featured flavor in this sauce, but also can be used in omelets, mashed potatoes, sandwiches and pasta dishes. For the sauce, use an oak-aged balsamic vinegar; unlike some harsh-tasting imitations, it will give the dish more sweetness and depth. 1. To roast the shallots: Heat oven to 400 degrees. Peel the shallots, toss them with a little olive oil and place in a baking dish. Roast until tender, turning occasionally, about 30 minutes. Cool and chop them finely. 2. To make the sauce: Place stock and vinegar in a saucepan; bring mixture to a strong simmer and let it cook until it’s reduced to about 3/4 cup. Reduce heat to low, add butter and whisk until well blended. Stir in shallots; season to taste with salt and pepper. Set the sauce aside but keep it warm. 3. Heat an outdoor grill or heat a little olive oil in two pans over medium-high heat. Season the pork chops generously with salt and pepper. 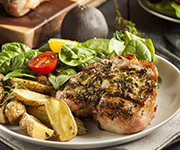 Grill or saute the pork chops until done, about 5–6 minutes per side. Top each serving with sauce and sprinkle with a little chopped fresh parsley or thyme.